It's easier than ever to search and apply for jobs, get one-on-one help from our recruiters and access great career resources. We've spent months making our website better for you—take a look around to see what's new. Before rebuilding ajilon.com, we got a lot of feedback from people just like you—people who want a better way to find jobs. You told us what you liked—and didn't like—about our old website. Then, we built on what was working and improved what wasn't. Based on actual suggestions from job seekers like you, we built a website that has the tools and resources you need for a successful job search. Our recruiters provided the real details on exactly how they help you find a job. Our new site should make it crystal clear. Redesigned from the ground up to work on desktops, laptops, tablets and phones. Now you can apply for a job anywhere. A whole new set of filters and search tools to help you quickly locate your next job. Now you can simply send us your resume and leave all the tough work to us. We cut the application time in half so you can apply to any job in a matter of minutes. Without an account. We have some pretty incredible career resources. Now you can access them quickly, easily and on any device. Actually, you no longer have to log in to your account. Your local branch still has all of your information and applications, but your account has been removed from our online system because it just isn’t necessary any more. Wait. Why did you remove my profile? Simple. Your profile is no longer required to apply for a job. Now you can apply without having to worry about your login and password information. Once you use the new application, you’ll see that it’s much easier! So what happened to my account information? If you were already working with a recruiter, they still have all of your information. If you applied to jobs but haven’t heard back from a recruiter yet, there is no need to apply again. Your local branch has your application and contact info. Well, it’s easier than ever to send your resume directly to a local branch, so that they can help you in your job search. 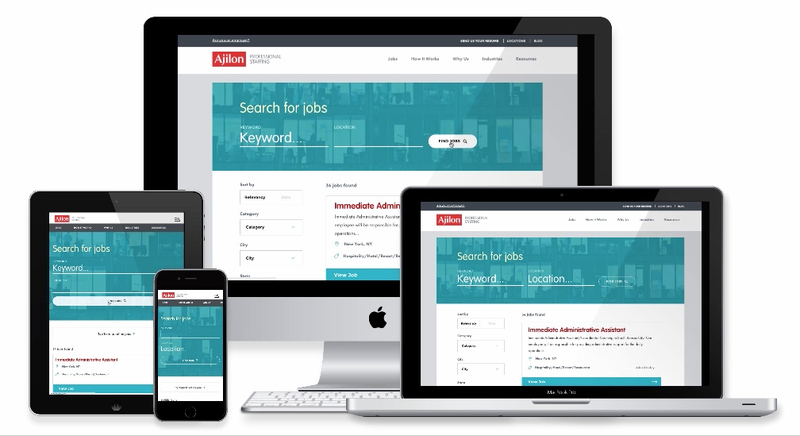 Plus, you’ll see that our new website works seamlessly on all of your devices, so you can apply for jobs from just about anywhere. After I apply or send my resume, how do you help me find a job? Does it cost money to work with Ajilon? No way, never! We’ll help you find a job at absolutely no cost to you.